Nia smiles after seeing her friends outside for the first time. She's one of 6,000 children helped by an Indonesia foundation. Jakarta, Indonesia (CNN) -- Nia's chest shakes with every breath, her frail body twisting on the threadbare mattress. The heat inside her room is almost suffocating. Her mother fans her and wipes away a thin film of sweat from the girl's forehead. "Sometimes at night, I ask myself: If I die, who will take care of her?" Nia's mother, Rita Zahara, says. She wipes away tears as she speaks. Her eyes are permanently bloodshot, her face etched with exhaustion. 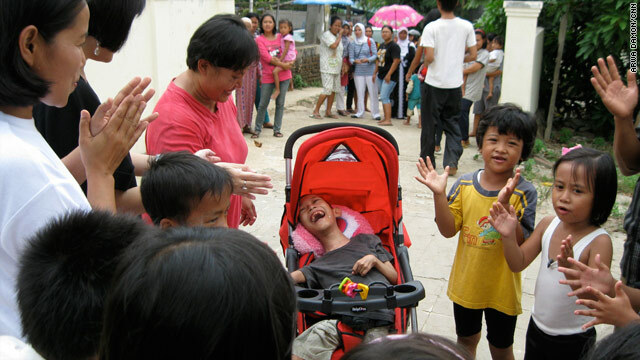 Nia has cerebral palsy in Indonesia, where help for disabled children is far behind the times. All the girl knows of the world is the peeling ceiling and the sliver of life that she can be seen through her door. She is the eldest of five children. Her siblings are all healthy. The family barely has enough money to survive. Rita has carried her daughter since she was born, easily lifting Nia's shrunken and delicate body. "All I wish is that she would walk like everybody else, but it's not possible," the mother says, the tears continuing to slowly roll down her face. Introduce: Natalie Tjahja, the founder of the Maria Monique Foundation which tries to help the dreams of a distressed family come true. When she first met Nia's mother, the girl's mom simply asked for a stroller so her little girl could see more of the world than what is in her room. The two helped Nia into a stroller and pushed her toward her her friends, who she has never seen outside her room before. The girl's face breaks into a smile. Tjahja's foundation is named after her own daughter who died at the age of 7 of an infection to her lungs. Doctors in Indonesia were not able to treat her. Tjahja sold everything and flew with her daughter to Singapore for treatment. Tjahja ran out of money, but the doctors continued to treat Maria Monique. Upon hearing her story, one of the hospital staff contacted the local paper. Donations began to flow in. Twice Maria Monique stopped breathing, but came back, astonishing doctors. Yet she eventually succumbed to her illness in 2006. One hundred days after her death, as Tjahja was pouring rose petals into a river as in Indonesian tradition, she says her daughter came back again with a message. "Maria Monique, she whispered in my heart. She said, 'Mom try to find many many children to give happiness,' " Tjahja recalls. "She is like my guidance angel." She began with just $50 to fulfill her daughter's wish. The foundation has since grown into something much bigger. To date the Maria Monique Foundation has helped over 6,000 children -- from providing prosthetics and wheelchairs to trips to the mall to coloring books. CNN also met with 13-year-old Nuriani, who was completely focused on her artwork in the dim room where she drew. She buried her face in her shirt to cover her tears while her mother spoke of her condition. Her mother explains she's not sure what's wrong with her daughter. When she was 3, Nuriani fell in a pond. Over the years, a lump on her back grew, looking more like a spinal deformation. The abscesses never healed; her mother couldn't afford to take her to a hospital. Health workers at a local clinic said the lump was the result of malnutrition. Nuriani is quiet, shy and spends most of her time engrossed in her coloring books, a gift from the Maria Monique Foundation. Her favorite pictures are two she drew of Maria Monique, because she says softly, "She's cute." The foundation gets its donations mainly by word of mouth. Tjahja works with teams of volunteers that have helped her reach children all over Indonesia. Tjahja has one simple aim: "When I give happiness to the children, when I see the smile, it's just so beautiful."